HDTV Supplys WolfPack 4K/30 24x36 HDMI Matrix HDBaseT Switcher is a pre-configured integrated HDMI video & HDMI audio modular HDMI matrix switcher. 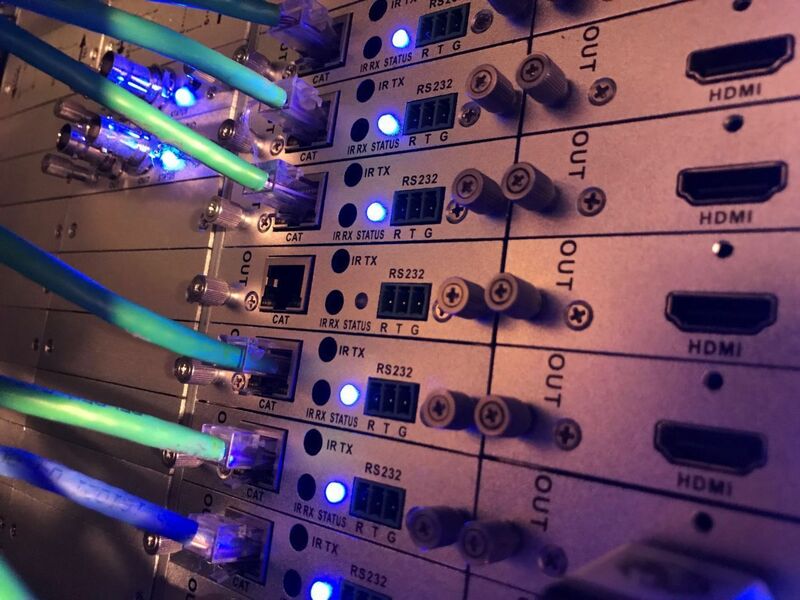 The 24x36 chassis back plane allows HDMI technologies to be converted & switched eliminating external converters and it allows any input to be routed to any output, or the same input to be routed to all outputs. The core of the 24x36 HDMI Matrix HDBaseT Switcher consist of an 36x36 Modular Matrix chassis & its highly configurable backplane that supports 24 input cards & 36 HDBaseT output cards to 36-HDBaseT receivers that are supplied. The 24x36 HDMI Matrix HDBaseT Switcher is also 4K at 30 Hz compliant. You can control the 24x36 HDMI Matrix HDBaseT Switcher via front buttons, WEB GUI control or the RS-232 serial port. The matrix does not have IR nor a remote control but can be controlled with its iOS and Android app. HDTV Supplys implementation of the HDBaseT technology and this product adds virtually zero latency to the HDMI audio and video signal, less than 7 microseconds (0.000007 sec) over 220 feet of CATx cable. At 100 feet you are talking about 3 microseconds (0.000003 sec). This means for example, in a church or auditorium, the speakers lips are always in synch with the video image on all the TVs and projectors 100's of feet away. HDTV Supplys implementation of the HDBaseT technology and this HDMI Matrix HDBaseT Switcher adds virtually zero latency to the HDMI audio and video signal, less than 7 microseconds (0.000007 sec) over 220 feet of CATx cable. At 100 feet you are talking about 3 microseconds (0.000003 sec). This means for example, in a church or auditorium, the speakers lips are always in synch with the video image on all the TVs and projectors 100's of feet away. EDID Explained: These HDMI Matrix HDBaseT Switchers EDID provides for optimal source-to-screen performance. EDID will optimize the video card output for the capabilities of the end display. The EDID ghost unit enables the copying, emulating, cloning, and "learning" of EDID data from a display. Our EDID Emulator and repeater comes with pre-defined presets, user programmable banks, Sink EDID sniffing bank and more. Our EDID Emulator ensures proper operation, for the best performing HDMI audio and video signal between any source and display Resolves loss of video, intermittent (flashing) video, snow, or color-space (purple or red) issues. Why not buy this 4K 24x36 HDMI Matrix HDBaseT Switcher w/36-HDBaseT Receivers & iPad Control today? The WolfPack 24x36 HDMI Matrix HDBaseT Switcher manages HDMI input signals for the inputs and HDBaseT CATx cabling for the output. This 24x36 HDMI Matrix HDBaseT Switcher support long haul transmission, maintains power reliability in the event of failure and offer the best flexible solutions for an AV system deployment. Our 24x36 HDMI Matrix HDBaseT Switcher also can support high-resolution HDMI sources routed to HDMI displays, monitors, projectors, or audio receivers, etc. The EDID can be selected between seven different modes or copied from the attached displays. Why not buy this 4K 28x28 HDMI Matrix HDBaseT Switcher w/28-HDBaseT Receivers & iPad Control today? Optional iPad Control of WolfPack HDMI Matrices & DirecTV: HDTV Supply Inc and Automation Connection Inc have teamed up to offer a solution for Sports Bars and Restaurants that allows an iPad to control and manage dozens of DirecTV Receivers and dozens of TVs when coupled with HDTV Supplys low cost WolfPack family of HDMI Matrix Switchers. 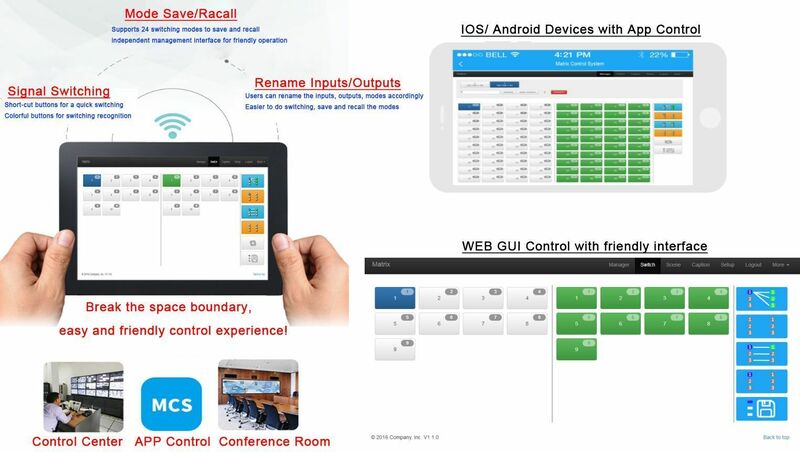 DTVGameControl from Automation Connection Inc is an iOS turn key application and is perfect for controlling and managing DirecTV Receivers, Video Tiling, Video Walls, even Audio in Sports Bars and Restaurants. Their unique user friendly sports guide gives you the ability of putting a single game on to multiple televisions with one tap of a finger. We think it's the best because DTVGameControl paired with our 4K WolfPack 8x16 Matrix Switcher, for example, allows the iPad to become the complete remote control for all of your TVs and it also allows the user to see what is playing on the selected DirecTV receiver in real time, prior to changing the channel. This gives you and your staff the ability to really focus on your customers rather than wasting time scrolling for games.